Baby Girl Woodland Patchwork Quilt. Perfect for any new baby girl's nursery. This modern quilt was made with a variety of woodland fabrics in shades of pink, winter white, aqua and gray. 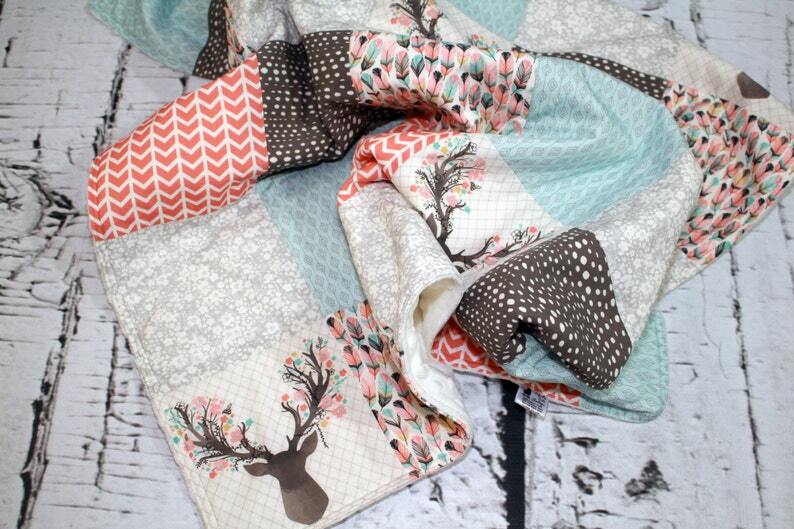 Deer, Arrows, Buck Heads, Aztec, feathers, woodland forest, chevron all adorn this woodland quilt. Quilt is a made to order quilt. Please allow 7-10 business days for completion. Larger size quilt will include horizontal quilting lines between each row for added stability. Infantly Cute proudly introduces our newest product dubbed by our customers as our “hybrid minky”. This minky patchwork quilt is made with designer cotton fabrics that are hand cut and pieced. We then add a layer of premium quality Warm & White cotton batting for warmth and comfort, and lastly we back it with a super soft, high quality Dimple Dot Minky from Shannon Fabrics. We recommend you wash this blanket on the gentle cycle in cold, tumble dry low. DO NOT IRON MINKY. Made in a smoke free, pet free home. All our products are handmade so subtle variations in pattern placement are to be expected. All materials have been pre washed to ensure a quality product. Infantly Cute Boutique products are made with the highest quality of materials. Fabric placement may vary. We take pride in the careful attention to detail we put into every item made. All of our items are made in a smoke free - pet free home. Thank you to the boutique for customizing the baby quilt for my first soon to be grandchild. It is beautiful and exactly what my daughter wanted for her little girl. It is beautiful 💕. Purchased for my niece who will be arriving in October '17. Could not be more happy with the materials, and though the patterns weren't the same as what is pictured, it still pulled together perfectly and I cant wait for her to get here and use it! !